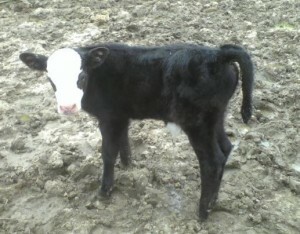 Baldie hereford cross born to a black cow (recip) at BOF April 24, 2009. I realize that Herefords are not the most popular breed of cattle currently (although they are a close second). Thanks to some good marketing by some other associations, most people think other breeds provide a better quality and are generally better. Personally, we chose Herefords because of their dispositions. They are very docile animals and when you have a small kid showing a 1000 + pound animal at a fair, in an environment they are not familiar with and people who might not be familiar with livestock, this was an obvious choice. We tried other breeds, black, Simmental and Limousin. Once a neighbor gave my daughter a hereford to show about 10 years ago, we were supporters of the breed. They have great attitudes and are terrific mothers. Most importantly, they yield a great tasting carcass. If my personal testimony has not convinced you, look at these facts. The data was collected by Circle A staff (an Angus breeder) and analyzed by Dan Moser, associate professor of genetics at Kansas State University and Vern Pierce, professor of agricultural economics at University of Missouri. 600 Angus cows were randomly bred to 10 Hereford bulls. The resulting progeny was compared to the offspring from three proven Angus sires. The Hereford-sired calves were 3 lb. heavier than the Angus calves at birth. But averaging 72 lb., the weight was nearly ideal for commercial operations. At weaning, the Hereford-sired calves were 11.9 lb. heavier than the Angus-sired calves, despite the Angus sires ranking in the top 20% of their breed for weaning weight EPD. Heifer calves were bred with the baldies showing a 7% advantage in conception rates over the straight Angus heifers. 75 of the Hereford-sired bred heifers were sold at Circle A’s annual production sale, where they sold for about $110 more than their Angus counterparts. Part of the steers were placed on feed efficiency test at Circle A’s feedlot. The Hereford-sired calves outgained the Angus by .15 lb. per day. While both breed groups were similar for fat thickness (Angus = 0.52 vs. Hereford = 0.54), Hereford-sired steers had about 13 more lb. of carcass weight and about 3/4 of an inch more ribeye area. Pierce set up an economic model to measure the advantages of this data for a typical operation. He says the advantage of using Herefords will be multiplied over the 10-year model. In the model using Hereford bulls on Angus-based cows will add $514 net over 10 years or about $51 per year per cow. Economic models also predicted that if replacement females were retained over a period of 10 years, Hereford-sired females would generate a 20% advantage in herd size for the same relative cost versus the straight Angus commercial cows because of increased fertility and longevity. This entry was posted on Wednesday, April 29th, 2009 at 9:24 am	and is filed under Uncategorized. You can follow any responses to this entry through the RSS 2.0 feed. You can leave a response, or trackback from your own site. I have a year old red hereford angus cross. She is a great cow and just had her first calf a couple of days ago! Both cows are great and I love them! Go herefords!